Tampa Bay Trial Lawyers Association | Swope, Rodante P.A. 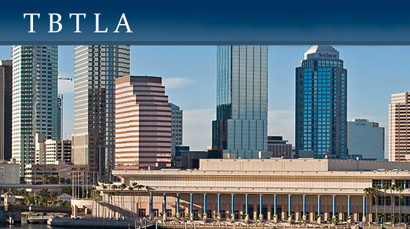 The Tampa Bay Trial Lawyers Association is a non-profit organization of lawyers representing consumers and is dedicated to upholding and defending the Constitution of the United States and the State of Florida. The Association accomplishes this goal by providing trial lawyers with educational resources to expand their understanding of the law, coordinating political lobbying and fundraising to benefit the injured, hosting networking events to advance the goals of the organization, and participating in charity to help the community. Unlike other trial advocacy organizations, the Tampa Bay Trial Lawyer’s Association does not accept members of law firms that represent large insurance companies or advocate on behalf of employers in workers’ compensation matters. All of the firm’s attorneys are members of this influential organization. Several of our attorneys also commit their personal time to serve on committees and as officers of the Association. In fact, Dale Swope is a founding member of the Tampa Bay Trial Lawyers Association, and served as President in 2000 and 2002. Angela Rodante was the President in 2006. Brandon Cathey currently serves on the Board of Directors. For more information on Tampa Bay Trial Lawyers Association’s activities, please contact Executive Director, Margaret Schumacher.